There’s always been a special place in Alice Cooper’s heart for the hair-metal ’80s, an oft-maligned era that saw the theatrical rocker revive his career with the pop-metal hooks of “Poison,” his first big U.S. single in 11 years. And his affection for those days resulted Saturday, Dec. 7, in the Christmas Pudding lineup most likely to speak to fans whose inner children may have spent some time in scarves and spandex while rockin’ (like Dokken) to MTV’s Headbangers Ball. The agenda was set when he lined up a hair-metal cover band, Hairball, to anchor a series of mini-sets by lead singers of popular bands who could then travel light for the charity concert, which benefits the Rock Teen Center Cooper and his Solid Rock Foundation opened in 2012. And all but two of the singers Hairball backed fell squarely in that category, the exceptions being the iconic Joan Jett (and two of her Blackhearts) and Cooper himself. Kip Winger dusted off the first two singles from Winger’s self-titled debut, “Madalaine” and “Seventeen,” the second of which included guest vocals from unannounced guest Robert Mason of Lynch Mob, who now sings for Warrant. Stephen Pearcy of Ratt stuck with his biggest Hot 100 entries, “Lay It Down” and “Round and Round.” Cinderella’s Tom Keifer did “Somebody Save Me,” “Gypsy Road” and “Shake Me.” And the biggest hair-metal icon on tap, Vince Neil of Motley Crue, followed Keifer with an equally brief sampler of his greatest hits — “Kickstart My Heart,” “Wild Side” and “Girls, Girls, Girls,” which found several singers returning to the stage to sing along. Before any of that, Hairball opened the concert’s second act with Van Halen’s “Jump” (which was blessed with a truly entertaining Diamond Dave impersonator), Twisted Sister’s “We’re Not Gonna Take It” and AC/DC’s “For Those About to Rock (We Salute You)” (which featured some impressive wailing on lead vocals). The first singer who didn’t fit the profile, Joan Jett, had the audience clapping and singing along to the crunchy riff-rock of “I Hate Myself for Loving You” before testing the waters with the least familiar song of the entire second act — “Any Weather,” the track that kicks off “Unvarnished,” her latest release. A bold move, to be sure, but one that didn’t seem to sacrifice her mini-set’s momentum any, recalling the infectious punk-rock effervescence of such early Jett classics as “Bad Reputation” and “Cherry Bomb.” And then, she signed off with a spirited audience singalong of “Crimson and Clover,” her spunky reinvention of a ’60s hit for Tommy James and the Shondells. Most years, that would have been the grand finale, fake snow falling from the ceiling as the whole room sang along to a song that feels more ageless the older it gets. But this year, he ceded the honors to members of Kiss, who performed without makeup and/or costumes. 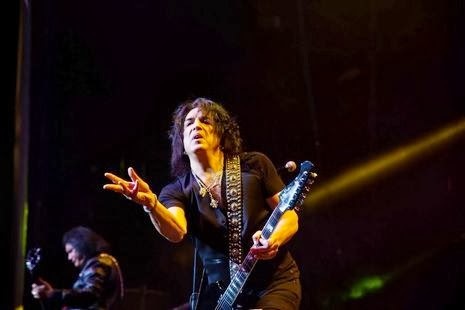 Cooper introduced their set, declaring them “America’s greatest rock-and-roll band” and making a case for their induction to the Rock and Roll Hall of Fame, suggesting that there are no more deserving acts than Kiss to be inducted. And they definitely rocked it, Paul Stanley working the crowd the same way he’s been doing it since “Alive!” as they made their way through such early Kiss classics as “Shout It Out Loud” and “Deuce.” They, too, showed the ’80s some love with “Lick it Up,” from the album that gave the world its first look at the men behind the makeup, tossing in the instrumental breakdown (and scream) from “Won’t Get Fooled Again.” And then, they kicked it into high gear, treating the fans to a triple shot of vintage Kiss — “Calling Dr. Love,” “Detroit Rock City” and “Rock and Roll All Nite,” which brought things to a close with falling fake snow and a stage full of all stars. By that point, it had been nearly five hours since Pudding kicked off with a first act whose highlights included Dance Through the Decades and a choir doing “School’s Out.” It may have peaked, though, when Rock Demarco, the world’s fastest painter, told the crowd Cooper had taken up painting and called him out to do a painting of Demarco. Cooper said he’d rather paint a girl, so they invited the speed-painter’s girlfriend, Olivia, on stage to pose. She couldn’t see the canvas as Cooper painted “Olivia will you marry Rock?” to wild applause. It was sweeter than those kind of stunt proposals tend to be and before he left the stage, Cooper joked “And next year, she will be delivering a baby on stage.” That’s classic Alice Cooper humor right there.